This is the first game in the Kingdom Hearts series. For other games in the series see the Kingdom Hearts category. Kingdom Hearts (キングダムハーツ, Kingudamu Hātsu?) is an action role-playing game developed and published by Squaresoft (now Square Enix) in 2002 for the PlayStation 2. It is the result of a collaboration between Square and The Walt Disney Company. The game combines characters and settings from Disney's animated features with those from the Final Fantasy series, developed by Square. 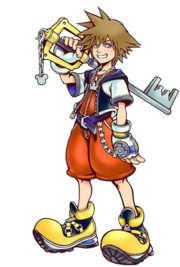 The story follows Sora, a young boy, as he is thrown into an epic battle against the darkness. He is joined by Donald Duck and Goofy, classic Disney characters, who help him on his quest. Kingdom Hearts was a departure from Square's standard role-playing games by introducing a substantial action-adventure element. In addition, it has an all-star voice cast which included many of the Disney characters' official voice actors. Kingdom Hearts was longtime Square character designer Tetsuya Nomura's first time in a directorial position. The game was praised for its unusual combination of action and role-playing, as well as its unexpectedly harmonious mix of Square and Disney. It received numerous year-end "Best" video game awards and was a dominating presence in the 2002 holiday season and went on to achieve Sony "Greatest Hits" status. Since its release, Kingdom Hearts has sold over 5.6 million copies worldwide. Kingdom Hearts begins on Destiny Islands, where Sora, Riku and Kairi live. The three friends seek to leave the islands to explore new worlds and have prepared a raft for this purpose. One night, the islands are attacked by darkness and shadow creatures. Sora seeks out his friends, finding Riku first. He disappears into darkness and Sora obtains the Keyblade. Using it to fend off the creatures, he heads for a secret cave, where he finds Kairi near a door. She turns to him, saying his name as the door behind her blows open. The ensuing blast of darkness sends Sora and Kairi both out of the cave. The islands are soon destroyed, and Sora is left adrift, while Riku and Kairi's respective whereabouts are unknown. Meanwhile, King Mickey has left his world to deal with the increasing power of darkness and left instructions for mage Donald Duck and knight Goofy to find the "key". Donald and Goofy use a Gummi Ship to travel to Traverse Town, where Sora has drifted. Sora encounters the shadow creatures again, and meets Leon, who explains the shadow creatures are Heartless, creatures that consume hearts, and that the Keyblade is the only weapon capable of defeating them. A man named Ansem, the leader of Leon's home world, is said to have studied the Heartless. Sora meets Donald and Goofy and the three decide to travel together: Donald and Goofy to find Mickey, and Sora to find Kairi and Riku. Released only in Japan, Kingdom Hearts Final Mix has several events and a number of gameplay tweaks that are not in previous releases. Spoken dialogue is in English, with Japanese subtitles. New scenes, clarifying certain plot points, such as Riku's journey and foreshadowing of Kingdom Hearts II, were included. A gameplay option allows the player to skip cut scenes after seeing them once. The optional bosses first included in the English version were introduced to Japanese players for the first time, along with "Unknown", in an attempt to raise interest for the sequel. In another attempt at foreshadowing, a video titled "Another Side, Another Story [deep dive]" plays at the ending if the player accomplishes certain tasks. New music tracks incorporated were "Disappeared" and "Another Side". The "Night on Bald Mountain" and "One-Winged Angel" tracks from the English version were included as well. Other changes include new abilities, new weapons, new items, additional and recolored enemies, and gameplay tweaks to make the game easier for the player, along with two new difficulty levels. 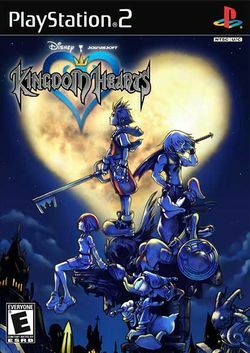 On the first day of the re-release, the game also included either a deck of Kingdom Hearts cards or a special music CD. A limited "Platinum Edition" version of Kingdom Hearts Final Mix was later released with an action figure of Sora, a sticker set, and sketches of some of the main characters. Kingdom Hearts Final Mix was one of three games to be re-mastered into HD (the other two being Kingdom Hearts Re:Chain of Memories and Kingdom Hearts 358/2 Days (cutscenes only)) under the name Kingdom Hearts HD 1.5 ReMIX. It was released on the PS3 and also includes trophy support. The HD remaster was released in Japan on March 14, 2013, and North America on September 10, Australia on September 12, and Europe on September 13 in the same year. This page was last edited on 10 February 2016, at 03:42. This page has been accessed 474,212 times.